"Who supported Obama in 2012? 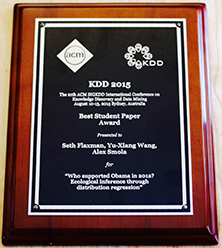 Ecological inference through distribution regression" Seth Flaxman, Yu-Xiang Wang and Alex Smola, won a Best Student Paper Award at the KDD 2015 Conference in Sydney Australia. Seth Flaxman just received his joint PhD degree in Machine Learning and Public Policy and is now a Postdoc at Oxford in the Department of Statistics. Yu-Xiang Wang is a third year student in the Machine Learning PhD program. Professor Alex Smola joined the Machine Learning Department in 2013. KDD 2015 is a premier conference that brings together researchers and practitioners from data mining, knowledge discovery, data analytics, and big data.